S-AIR in association with Curators’ Network is offering a fully funded residency opportunity for curators in Sapporo, Japan, from August 9 – September 13, 2016 (maximum stay 30 days, minimum 20 days). The call is free of charge. Deadline for the submission of applications is July 3, 2016, midnight, Madrid, CEST timezone. The successful candidate is expected to research and write around the local art scene of Sapporo, to learn about Japan and to establish networks and dialogues between local and international artists. The call is open for curators who work with all kinds of disciplines within the context of contemporary visual and fine arts. There is no age limit. Applicants should neither hold Japanese nationality nor reside in Japan, and should be able to exercise a degree of autonomy and self-reliance. The call seeks especially for professionals who work with a high level of excellence, but do not yet have a consolidated international career, as one of the primary goals of Curators’ Network is to promote art-professionals who are still not well known in a larger international context. Applicants should have at least a moderate level of spoken English or Japanese, and should feel comfortable engaging in discussions in one of these two languages. Applying curators should thoroughly research about S-AIR and Curators’ Network and submit a proposal demonstrating in which line(s) they would like to research whilst in Sapporo. Deadline: Applications should be submitted online NOT LATER THAN Sunday July 3, 2016 at Midnight [Madrid, CEST]. Selection: The resident will be chosen on the basis of the submitted applications. A shortlist will be made by a jury of the management board of Curators’ Network. The final selection will be made by the selection committee at S-AIR. Notification: The successful candidate will be notified byWednesday, July 13, 2016. Residency: Up to 30 days between August 9 and September 13, 2016. The applicants can propose their preferred time frame, the minimum stay is 20 days. The final dates for arrival and departure to and from Japan to be agreed between S-AIR and the resident. Tokyo Wonder Site (TWS) launched its residency programs in 2006, cooperating with art centers and cultural institutions all over the world. Now they are calling for “International Creator Residency Program 2016”, aimed at international creators/ curators/ administrators who are willing to perform new creative activities during their programs at TWS Residency. -who practice in any of the following cultural/ artistic fields: visual art, architecture, design, curation and administration. 2 creators for each period/ 6 creators in total are to be selected. Download the “Application Outline” and “Application Package” and send all materials to TWS Residency. Please read “Application Outline” carefully about details. *For inquiry which is not listed in FAQ, please contact us by e-mail byOctober 4, 2015. We will update FAQ on TWS website after October 7, 2015. Please note that in principle, they cannot answer each inquiry individually. More about Tokyo Wonder Site Residency Programmme here. Save the date for the next Young Portfolio Acquisitions, of the Kiyosato Museum of Photographic Arts, in Japan. The next submission period is April 15 – May 15, 2015. TOKYO INTERNATIONAL PHOTOGRAPHY FESTIVAL COMPETITION. Deadline: June 30, 2014. The goal of the Tokyo International Photography Competition (TIPC) is to create a series of cultural and geographical bridges between some the world’s largest photographic communities. It provides a unique opportunity for photographers from across North America, Europe and Japan to present their artistic visions beyond their country’s borders and open up possibilities for cross-pollination and cross-border collaborations. There are numerous competitions whose aim is to discover new photographic talent from around the globe, but many of these opportunities are often beyond the reach of those who do not speak a certain language or have a deep understanding of a particular culture. This has often been the case for Japanese photographers trying to enter foreign markets and for foreigners wanting to present and exhibit their work in Japan. The highly celebrated launch of TIPC in 2013 was the first step of a three-year journey that will culminate with the launch of an international photography festival in Tokyo, starting in 2015. In August of this year, in addition to the second – expanded – edition of TIPC, The Tokyo Institute of Photography will present the first Tokyo International Portfolio Review, bringing together internationally-renowned editors and curators from around the world. Nine internationally renowned jurors from around the world will review all the images submitted and nominate a diverse group of talented photographers whose work will be exhibited in Tokyo and Brooklyn in the fall of 2014, and Berlin in the spring of 2015. Identity is the way we are defined and recognized by ourselves and others. Who do we relate to? How do others relate to us? Nationality, religion, and gender are some of the ways we place ourselves into collective groups; while unique characteristics distinguish us as individuals. The Tokyo International Photography Competition invites you to explore this complex concept of “identity” in our ever changing world. A group of 8 photographers will be selected by other Jury to present their work in a group exhibition that will travel to Tokyo (JP), New York (USA), and Berlin (DE). 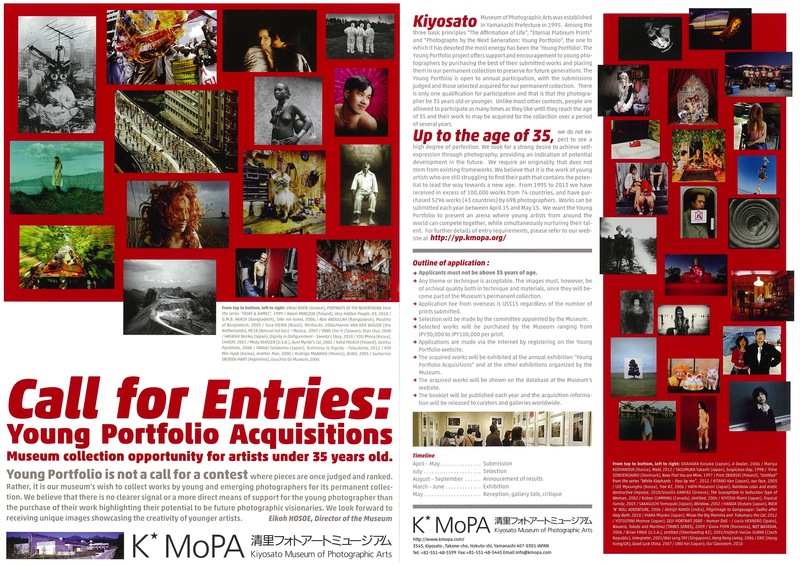 – All-expenses paid trip to participate in the Tokyo International Portfolio Review taking place in August 2014, in Tokyo, Japan. – Double-page feature in PHaT PHOTO magazine. – Special Feature in LensCulture. Reminders Photography Stronghold Residencies in Tokyo. Next deadline: September 10, 2013. I was made aware of this opportunity through my friend Manik Katyal, who is one of the judges for this grant. Mmmmh. I don’t like the small text that much: “*Printing, framing, insuring and transportation will be covered by the applicant”. However, have a look at this if you need a good excuse to go to Tokyo. Reminders Photography Stronghold – NOW OPEN FOR ACCEPTING THE WALL AND RESIDENCY PROPOSALS. Upon receiving you proposal our commissioned judges will review your proposal. If your proposal is successfully approved, you can use our gallery space for 5 days or more – up to 30 days for free. Photographers, curators, galleriests, book publishers and organizations as either initials or a group are eligible to apply. *Our gallery space is one of the largest individual galleries in Tokyo. 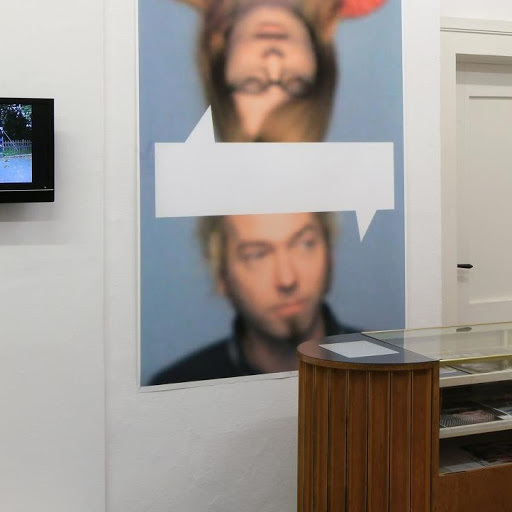 *Benefits of showing work in our exhibition space include world wide publicity . Using our global network, we will be supporting the publicizing of photographers and their works, your photographic presentation or campaign, or your book launch. Any alternative proposal on photography for the best use for this gallery space is welcome – but all proposals will be reviewed and only successful proposal will receive this grant. *If you are selected, you will receive 5-days free stay at the RPS residence. *Printing, framing, insuring and transportation will be covered by the applicant. If you contribute to take part of in a photo exhibition, workshop, lecture or artist talk or make any contribution to the benefit of RPS – you can stay at our residence for up to 5 days. You need to submit the proposal and our commissioned judges will review the proposal. To apply each grant, please go to http://reminders-project.org/rps/grants/.